NEW DELHI — South East Asian region receives the highest number of travelers with China topping the list, according to the World Tourism Organization report. Tourism has been one of the growing economic sectors across the world. According to the report by World Tourism Organization the international tourist arrivals have increased from 25 million globally in 1950 to 278 million in 1980, 674 million in 2000, and 1,235 million in 2016. The Asia Pacific region accounts for 30 percent of the world’s international tourism receipts. The region has outperformed all other regions in terms of growth, with international tourist arrivals increasing an average 7% per year compared to the world average of 4%. China remains one of the leading destinations in Asia. It attracted the highest number of tourists in the region with a record number of inflow of 59.27 million people in the year 2016. Great Wall of China draws highest number of visitors followed by Forbidden city, Ming dynasty palaces. Apart from the architectural feats China has many natural sites that attract international tourists. Thailand attracted second highest number of tourists in the region with 32.58 million visitors in 2016. The country has an easy visa policy that makes it easier for tourists to travel. Malaysia attracted 26.75 million tourists last year, although the average number of days of stay decreased. Japan and India followed with 24.04 and 14.56 million tourists respectively. In India, it was a new high since foreign tourist arrival crossed ten million for the first time and pushed the country’s earnings to 27 billion dollars. The numbers also helped the country go up 25 places in the Tourism competitive Index. South Korea had the sixth highest number of tourists in the year 2016. However the numbers plunged to a low owing to the boycott by Chinese tour groups after South Korea installed the Thaad system. 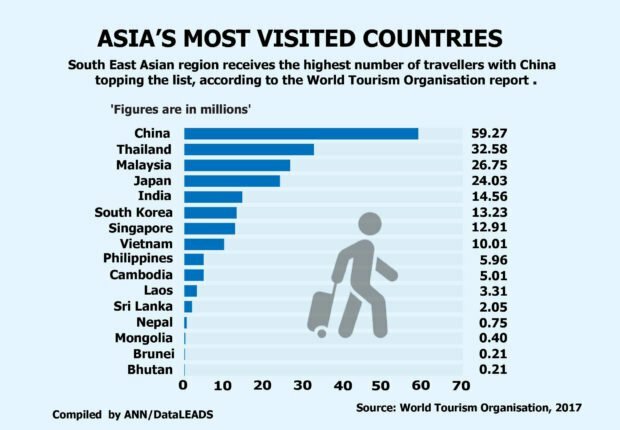 Singapore and Vietnam followed with 12.91 million and 10.01 million tourists respectively. In 2017, Philippines’ tourist arrival went up by 11 percent at 5.96 million. South Koreans remained the highest numbers of visitors to the country. It was followed by Cambodia, Laos and Sri Lanka. The lesser visited countries of the region remained Mongolia, Brunei and Bhutan.